Jimmy Sanders of Mythica Gaming sat down to talk about his RPG card game, Fates of Madness, how he partnered with Legendary Games to make this happen, and more. Because the concept of a card game RPG is intriguing, let’s jump in. EGG EMBRY – Thanks for agreeing to share some details about Fates of Madness. What’s the game about? JIMMY SANDERS – In Fates of Madness, a group of four adventurers attempt to survive the dangers and horrors of the world as they traverse through various locations. The game concludes when a large boss monster attacks the party. If any adventurer survives, the party wins. When I began work on Fates of Madness, I set out to design a game that could quickly and easily simulate an RPG experience. 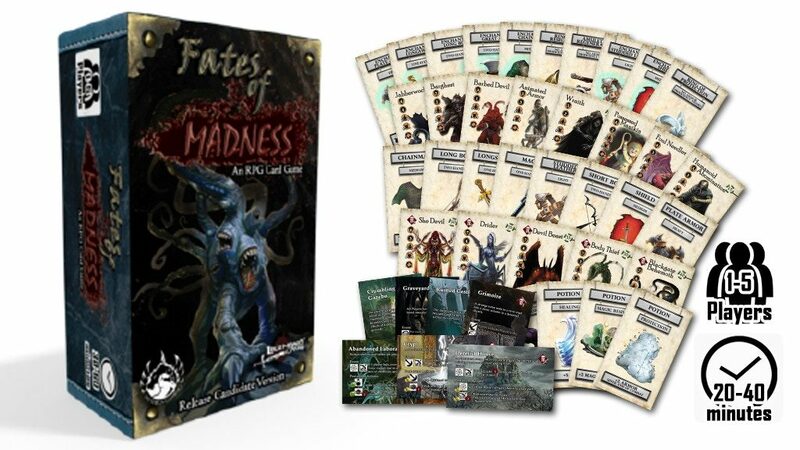 Fates of Madness is designed in a way that can allow for both solitary gameplay, along with cooperative play of up to five players. EGG – This is a card game, which begs the question – How is this card game an RPG? JIMMY SANDERS – To me, an RPG is a game where you control a character in a simulated reality. As the game progresses, you choose how and what that character does, with the hope of growing more powerful in some way. 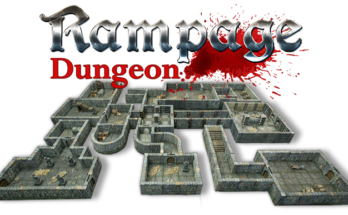 In Fates of Madness, I have attempted to create a dungeon crawl style game. For people familiar with systems such as Dungeons and Dragons or Pathfinder, Fates of Madness should give you a similar gaming experience. In Fates of Madness, you create an adventuring party of four people. You can create this party out of eight different characters, providing a wide variety of party combinations. If you play the game by yourself, you control all four characters. If you play with two to five players you can choose to have someone play as the GM for the game. Each turn players draw a Location card. On this card there will either be a monster that you have to fight, or a scenario you have to complete. Once you have either completed the scenario or defeated the monster, each player gets a Post Event Action to either search for treasure, use a Heal skill, or use Alchemy to make a potion. Once a certain number of Location cards are drawn, a boss monster comes out to try and kill the party. Throughout the game you must make decisions on how you will fight the monsters, and what is the best Post Event Action to take given your current circumstances. EGG – How would a GM work in this card game? JIMMY SANDERS – In Fates of Madness, the GM controls the Location deck, along with the Treasure deck if desired. Each Location card has a brief description of where the party is and what is happening. Ideally the GM uses these cards to create a kind of story where the players are adventuring. It is up to the GM whether he wants to choose Locations that are easy or difficult for the party. EGG – The game is “based on the Gothic Campaign Compendium” for Pathfinder. How has that book influenced your game? JIMMY SANDERS – It has a large degree of influence actually. 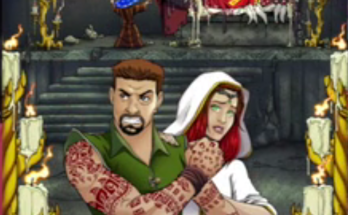 First, all of the playable adventuring characters are based off of the pregenerated characters in the book. I did my best to emulate the essence of the character, while being simplified to work in my card game. Second, many of the monsters and background scenes also came out of the Gothic Campaign Compendium. Third, and most importantly, it set the theme for the game. Many of the Locations have a macabre setting appropriate for a Gothic Horror game. Most importantly, I use a Fate deck to simulate die rolls. Whenever a situation comes up where you would normally roll dice, you instead draw a Fate card. The Fate cards are numbered one through six. In addition to regular Fate cards, there are also Madness cards which can be added into the Fate deck. A Madness card has a value of one. In addition, if a monster draws a Madness card when attacking, they use a special attack instead. Also, if a player draws a Madness card when attempting an Attribute Check, such as when searching for treasure, they automatically fail. 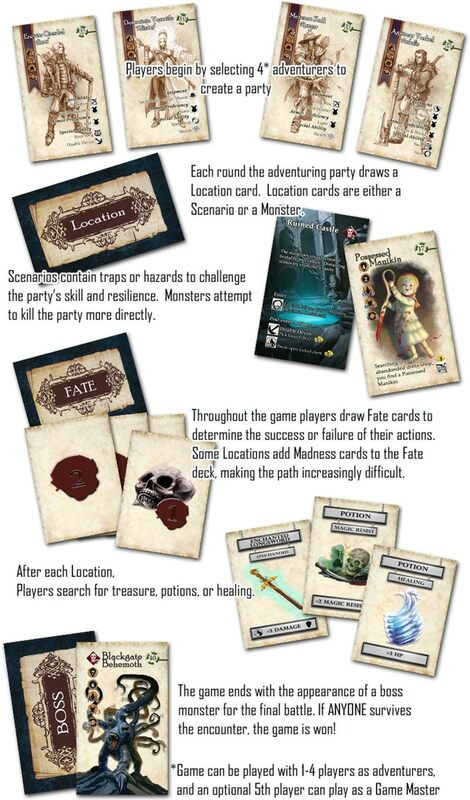 Players can choose to increase or decrease the difficulty of the game based on how many Madness cards they add to the Fate deck. EGG – This is the first project developed between Legendary Games and Mythica Gaming. How did that combination come about, and what does each company bring to the table? JIMMY SANDERS – Back in November of 2016 I first met Rachel from Legendary Games at Gamehole Con in Madison, Wisconsin. I was demoing my card game Legends of Draxia there. We met, she played the game, and we talked about various gaming industry related topics. Nothing came from that first meeting. Nine months later we met again at Gen Con. Earlier that day she had been talking with Jason, the head of Legendary Games, and they decided they needed to add board and card games to their product catalog. Through a chance meeting at Gen Con, she remembered liking my Legends of Draxia card game and asked if I was interested in working with Legendary Games, which I was. Primarily, Legendary Games provides existing I.P. and a distribution network to the partnership. This will allow for a quicker, faster, and more efficient development of a joint project. What Mythica Gaming provides is my game design skills, a talented graphic designer (Theresa Weibler), and an insight into the board and card game manufacturing world. Essentially, Legendary provides Mythica with raw resources, we polish it into a salable product, and then Legendary and Mythica sell it together. EGG – At Origins Game Fair and Southern-Fried Game Expo, you were running demos of the game, how was it received by new players? JIMMY SANDERS – It was received very well at both conventions. We had many players play it a second time, choosing a different group of adventurers to see how the experience would change. People could learn the game in just a few minutes, and often times taught new players for me. I think some of the most fun was had whenever there was a group of three or four guys, and one of them played the GM role. The GM would often times start with the preexisting text on the card, and then add an extra line or two that related to past games the group had played, making it an immersive experience for all at the table. EGG – Before this, Mythica Gaming created and Kickstarted Legends of Draxia, a strategy card game. You’re turning Draxia into an RPG, can you share some details about the setting and system? JIMMY SANDERS – Such a simple question has a huge answer, so I will try and keep it brief. 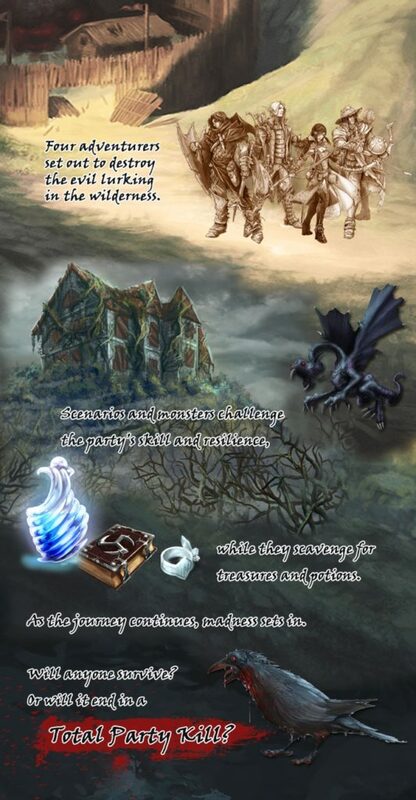 The Draxia setting is designed as a full world, with unique ways that magic works, undead are created, and a variety of different cultures. The most important thing to know about the Draxia setting is how magic works. In Draxia, magical energy exists in low concentrations everywhere, too indistinct to interact with. Magical energy has two basic properties, reflected by metals and adheres to liquids. If you create specially designed metal bowls and fill them with a liquid, you concentrate magical energy into that liquid. These bowls are called mana pools, and they create mana. Once you have mana, people can perform a wide variety of magic from throwing fireballs to increasing their strength temporarily. As a system goes, it is all D6. All die rolls use the core attribute to determine the number of D6 to roll. For example, if you had three strength and you are attacking someone in melee, you roll 3D6. You then add any appropriate modifiers from abilities or enchantments. If the result is equal or above the armor you hit. If you exceed by 5+ it is a critical hit, 10+ a double crit, etc. Each critical means you roll an extra D6 of damage. Failure by 5- means a critical fail. The system is incredibly flexible for character creation. It is a classless point buy system. A GM assigns XP and you spend it on either attributes, skills, or special abilities. XP spent on abilities gives you access to better abilities as you work down the ability tech trees. In addition to high levels of character customization, there is also custom item crafting and spell crafting. To craft an item you pick and choose what masterwork attributes you want to add to the item. Whether it’s damage, chance to hit, damage penetration, or some special attribute, you add up the total masterwork points from each table and craft a masterwork X object. You can create spells in a similar way. All of the casting attributes are in tables you can pick and choose from. For example you could make a lighting bolt spell have a one mile range. It will do little to no damage since most of the points were spent in range. However, it you gave the spell a twelve hour cast time you have created an artillery spell that has range and damage. There is a ton more I could talk about, but if you are curious it is a free PDF on my website mythicagaming.com. The system is still in development, but definitely playable as it stands. EGG – Where can fans learn more about the Kickstarter, Legendary Games, and Mythia Gaming? 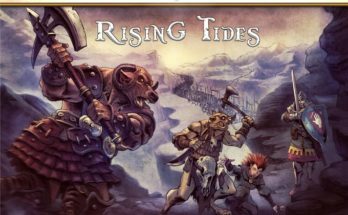 JIMMY SANDERS – As you would expect, go to the Fates of Madness Kickstarter page to find out about the various KS reward tiers. The Kickstarter ends July 9, so it is ending soon. For more information about the Mythica Gaming team and the Draxia world you can check out www.mythicagaming.com. For more about Legendary Games you can go to www.makeyourgamelegendary.com.